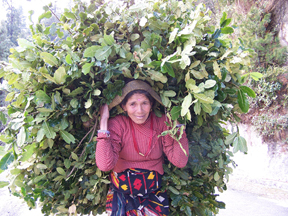 SeedTree also protects forests in Nepal by promoting and implementing energy conserving technology. 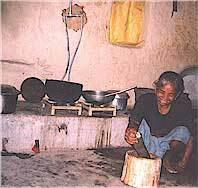 Improved smokeless stoves conserve 25% of the firewood needed for a traditional stove. This efficiency saves firewood gathering time and forest resources. The chimneys attached to these stoves remove smoke from the home environment particularly benefiting the health of women and children. The cost of improved smokeless stoves is affordable so they benefit even the poorest homes. Biogas (methane generated from human and animal waste) has been called Deep Green Energy for its many benefits in rural human ecology. • reduce labor, since women now spend one day a week to collect a backbreaking 60 - 80 lb. load of scarce wood or fodder. • provide lighting needed for evening study, literacy classes, home and community activities. An Introduction to Biogas. & Biogas in Rural Costa Rica. For a detailed explanation of biodigester use see Professor Chan's article.